Two leading British aid organizations say that thousands of needless deaths occurred from famine in East Africa last year because the international community failed to heed early warnings. Oxfam and Save the Children say it took more than six months for aid agencies to act on warnings of imminent famine. Between 50,000 and 100,000 people died in Kenya, Ethiopia and Somalia. The agencies say governments, donors, the United Nations and NGOs need to learn from the mistakes. In a report titled “A Dangerous Delay”, the agencies say a culture of risk aversion stalled a large-scale aid effort. They say part of the problem was that the governments of Kenya and Ethiopia were unwilling to admit the scale of the disaster, but also that aid agency staff felt they had seen the problem many times before. “Many donors wanted proof of a humanitarian catastrophe before acting to prevent one,” the report says. 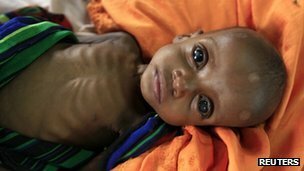 By that time it says, “malnutrition rates in parts of East Africa had gone far beyond the emergency threshold and there was high profile media coverage of the crisis”. At one stage during the famine the United Nations estimated that 10 million people were in need of humanitarian assistance. Hundreds of thousands of refugees went to camps in search of food, especially those from parts of Somalia where government forces have been fighting Islamist al-Shabab rebels. The report calls on all parties to take crisis warnings more seriously. “All members of the international system must improve their ability to prevent the worst effects of hunger crises before they happen,” it says. In the report, Oxfam and Save the Children looked at their own role in the crisis as well as that of other agencies. “We all bear responsibility for this dangerous delay,” said Oxfam’s Chief Executive, Barbara Stocking. Save the Children’s Chief Executive, Justin Forsyth, said clear warnings had been ignored. “We can no longer allow this grotesque situation to continue; where the world knows an emergency is coming but ignores it until confronted with TV pictures of desperately malnourished children,” he said.